To celebrate the return of many Bryant Park summer programs, and to introduce our readers to our fantastic partners, we asked our partners to write guest blog posts. Dan Fishman, Programming and Events Associate here at the park, interviews Talia Castro-Pozo, the producer of Dancing in Bryant Park. Dan Fishman: Hi Talia. Thanks for taking some time to chat with me. First question: if you are talking to someone who has never been to Dancing in Bryant Park, what do you say to them to get them excited? Talia Castro-Pozo: I have friends who don’t dance–to them I would say, “Come enjoy the beautiful park, spring in New York and you will get motivated to join us for a dance lesson and watch the amazing dancing. These are some of the best bands that New York has to offer.” And to my friends who are dancers, I explain the variety of bands that we offer and they just can't wait to be there. I’m often most excited to share this with beginners, people who may not have a place like this to go to. Everyone gets in such a dance mood–everybody’s happy, relaxed. And it’s such an easy way to meet new dance friends. That is one thing that’s so wonderful about these dance events: they really break the ice and make people more open to meeting new people. DF: I definitely agree that the social aspect is one of the best parts. I’m sure that will be the same this year, but is there anything new that you’re particularly excited about? TCP: Yes, definitely. We’ve worked hard to add more variety this year. Bringing Lester Lanin Orchestra–they are such a famous orchestra–and they are so different. I don’t think many people expected us to go with a waltz, so I think we’re opening with a very unexpected night. Dancers will have the opportunity to dress up and many people who have never danced the waltz will be a part of it. And of course Lester Lanin Orchestra has played all over the world for people like Prince Charles, Lady Diana, and Billy Joel–so he’s a celebrity musician. 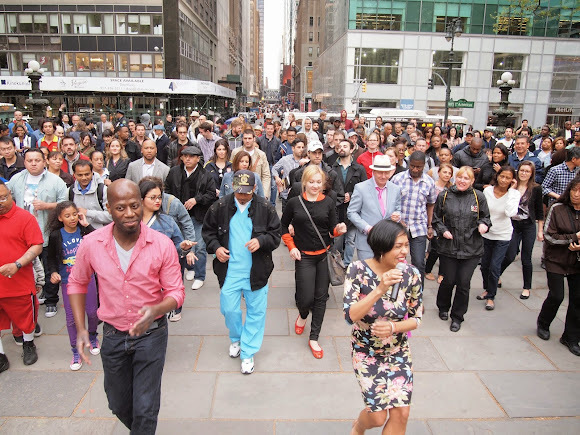 Talia leads the crowd in fancy footwork in 2014. DF: How about this year’s first-ever Latin Dancing Festival? TCP: Yes, of course! The Latin Dancing Festival is a dream come true. I do a lot of Latin events and New York is a capital for Latin music, but I have never, ever been to a party with three such amazing bands. I think we are going to close the series with a bang–it will be so amazing to see. They bands cover different ages and different styles, but they all are very New York. I’m so looking forward to that night: it will be 5 hours of amazing music and dancing. DF: I’m curious – after all of the fun of last year’s series, what would you say was your favorite moment? TCP: Wow. My favorite moment! I think it was one night when we had over 1,000 people–everyone was dancing and looking around. We had all kinds of people: babies, young people, professionals, older people, tourists—it was such a beautiful New York scene. Personally, Bryant Park is my favorite park in the city. And when the park asked me to do this event last year I was thrilled. When you have 1,000 people dancing and smiling and having fun with live music playing on a beautiful spring night–that is just so fantastic.